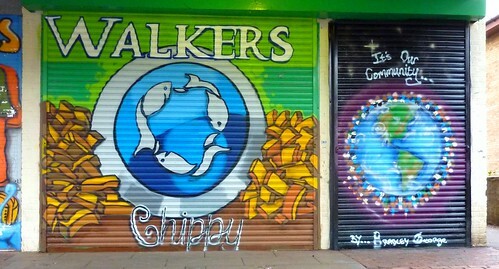 A new chip shop, Walkers Chippy, on Serpentine Court, was due to open mid November and needed their shutter painting appropriately. Then young Bradley won a drawing competition to design the second shutter on the chippy, and the 2 shutters were then painted together with the help of Kim a street artist from Sydney Australia, and Miriam of MKCVO who helped organise and run the competition. thanks to all , it looks great. This entry was posted in Workshops and tagged arkadegraphics, Chippy, graffiti shop shutter, kim gogan, miriam barrett, mkcvo, shop shutter, walkers chippy. Bookmark the permalink.